Some things in life are best in Black and White. Any Newcastle fan would validate that the club colours have a very canny resemblance to the highs and lows of emotions that they have been put through because of their legion. The Geordie fanatics have endured the abominable affliction of being relegated from the Premier League, and have reveled in the delirium of beating the likes of Barcelona and Juventus, turning the San Siro into their backyard party. All within a period of two decades. At the start of the campaign, Newcastle, not only the club but the whole city was excited. High in anticipation and high in spirits. The club had qualified for Europe for the first time since the 2006–07 season, having finished 5th the previous year. Fourteen games into the season, the black and white of Newcastle seem to have given away to shades of grey. The team has now lost four on the trot for the first time since 2008. The battle for Pardew and his boys is now an uphill one. Not only about getting the team back on track but also to have the faith of the Toon Army restored. So what’s bothering the men in black and white? In a summer that was wreathed in anticipation at Tyneside, regarding the recruitment that Newcastle would make to strengthen the squad that had finished 5th the season before, the only player brought in worthy of pushing for a first-team place was the young Dutch midfielder Vurnon Anita. The Newcastle first 11 is capable of giving any side a run for their money when at full strength and on song. However, the flawed summer recruitment leaves the club with a paper-thin squad. It was apparent last year but Ashley and co. got away with it. This season however, hasn’t been kind to them and they are feeling the full brunt of their transfer market failures. Suspension and injuries have reduced the squad to its bare bones. Last year’s backline prowess was build upon the continuity of the same back four for the first 11 games and then Williamson shifting into Taylor’s place for the injured Englishman for the latter part of the campaign. This time round, the story has been quite different. Injuries and suspensions have meant that Coloccini and Tiote have started a match together only 3 times so far, resulting in a lack of defensive fortitude. Cabaye and Tiote, the midfield duo that had brought so much success to the team last season have only paired up for a match this season 3 times which includes a 24 minute pairing against Sunderland, after which Tiote was sent off. The back-up players like Gosling and Vuckic remain on the doctor’s table as well. The stinginess of Newcastle in the transfer market has come come back to haunt them big time. Newcastle went on a rampaging run towards the end of the campaign last season when they went on a 6-game winning streak. During the run, the Magpies used a three pronged attack where Demba Ba and Hatem Ben Arfa flanked on the left and right respectively, while Papiss Cisse, who was on a miraculous run of form, went down the middle. Owing to some terrible form off late following Cisse and Demba Ba’s early season goal scoring burst, the same line up has never come to fruition this season. Pardew has kept both Ba and Cisse down the middle and has tried to pacify both the Senegalese rather than look for a better all-round footballing team. Playing both the Senegalese means the Newcastle midfield is overrun in the central areas as neither of them tend to fall back into the hole to help the midfield out. For the 4-4-2 itself to succeed, it needs strong wingplay down the flanks to compensate for the numerical disadvantage down the middle. Newcastle have two wingers in Ben Arfa and Guttierez who both tend to cut inside and are poor crossers of the ball (25% cross accuracy). The crossing of the wingbacks in the form of Santon and Simpson itself has left a lot to be desired (17% and 18% cross accuracy respectively). This renders the 4-4-2 ineffective. With neither Cisse or Ba falling back to support the midfielder, the 4-3-3 (4-2-3-1 originally) has to come to the fore to rescue Newcastle from the slump. Newcastle have been the most direct team in the Premier League this season, using route one football as one of the staples of their offense. They have played 931 long balls this season (a league leading 18% of their passes) which is 207 more than their nearest competitor Stoke City at 724. 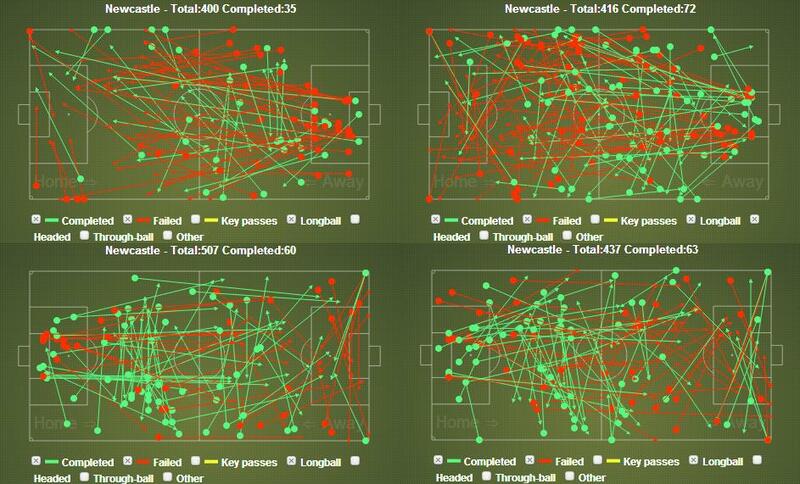 The tactic is really inexplicable as it does nothing but harm Newcastle’s offensive prowess. Newcastle used long ball tactics in the first half of last season when they had a certain Leon Best in their line-up. Leon Best was a perfect target-man who flicked the ball on for the likes of Demba Ba or held the ball up for the likes of Cabaye and Ben Arfa to get invloved (52% aerial duels won). Demba Ba or Papiss Cisse are nowhere near the target man that Best was and the stats don’t back them up either. Ba and Cisse win 36 % and 24% of their aerial duels respectively. This tactic also eliminates the likes of Cabaye or Ben Arfa to have their say in the games and hence the creativity in Newcastle’s offense has been missing. The ball retention has gone down the slope as neither the forwards retain the football nor anyone in the midfield gets a chance to play it around. Even in matches where the Tynesiders have resorted to the 4-3-3, the team line-ups have been dysfunctional – Shola Ameobi popping up as a right-winger, Ben Arfa going to the left wing all of a sudden, even though he was most effective down the right. This resulted in a sudden a dip in his early season form. The central midfield has the likes of Guttierez and Perch, both of whom are really poor passers in term of creating something from the midfield. Perch has been used at centre midfield, right back and left back. The likes of Guttierez and Anita too haven’t been able to settle down into one position. All this shuffling in the system leads to lack of understanding of their individual roles as well as how to incorporate themselves in the larger scheme of team football. The lack of prowess of Ba and Cisse has been well highlighted in the set-piece count as well. Newcastle have scored once in their last 242 corner-kicks. The last time Newcastle scored from an indirect set-piece was against Wolves in October 2011. There has only been two headed goals from Newcastle this season,the lowest in the Premier League as well. This goes to show a lack of creativity, poor deliveries and even worse execution on the part of Newcastle. The team in black and white seems to be a “one trick pony” when it comes to set pieces. Mike Williamson (and sometimes Steven Taylor) is posted at the corner of the box and a straight, instead of a diagonal ball, is played to him to head it back into the cluster of players attacking the the six yard box. The defectiveness of the ploy should have been apparent by now. This scheme was installed by Chris Hughton during his reign when he had a certain Andy Carroll at his disposal. Hughton cleverly used the ploy to isolate Carroll on a one-on-one situation to exploit his aerial prowess. 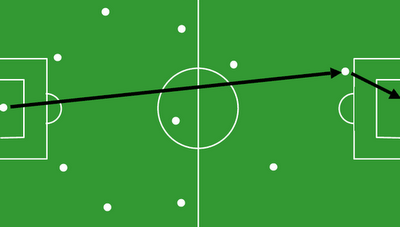 This can be seen to be perfectly played out in the following video in Pardew’s first match against Liverpool. Pardew should have figured out by now that Williamson and Carrol’s abilities in heading the ball are quite different. Demba Ba was in scintillating goal scoring form early last season as well, when he netted 15 times before leaving for the African Cup of nations in December. 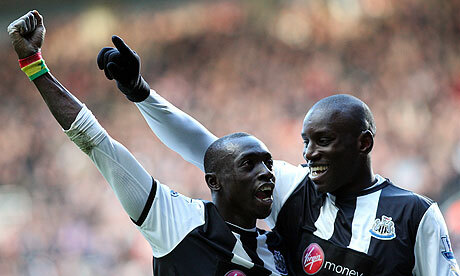 He convinced his countryman Papiss Demba Cisse to join him at Tyneside. Cisse finally did and the Newcastle faithfuls were convinced they would have another front line to boast of along the lines of Shearer and Les Ferdinand. Since getting Papiss Cisse from Freiburg in January this year, Papiss Cisse and Demba Ba have never scored a goal in the same match when starting together. If that’s not enough reason to understand that they don’t complement each other, I don’t know what is. Neither of them is an efficient target man that can hold up play and bring others into the game. Both the Dembas like to run the channels and one of them has to be sacrificed into a wider role to get the team more balanced. With all that said and done, success breeds success. If anything that has taken the biggest hit in recent weeks, it is the the self-belief of the players. Last year, average players like Williamson and Simpson couldn’t put a foot wrong. Now they can’t put a foot on the ball. Others like Guttierez have struggled mightily to be effective. His form this season has been absolutely woeful. He’s been slow, clumsy in possession and has made no meaningful contributions going forward. Tiote leads the EPL in Minutes per Possession Won and 2nd in Minutes per Loss of Possesion. That gets the midfield nowhere useful. It’s now on Pardew to pick up the pieces and haul this team towards something close to steady. Mike Ashley needs to back his manager and spend the moolah or else this year might just end up being 2008-09 revisited. Here is me signing off hoping that it doesn’t come to that.